At Monroe Carell Jr. Children’s Hospital at Vanderbilt our work extends beyond patient exam rooms. We are also searching for discoveries to offer better treatments, and, hopefully, find cures for pediatric patients. The profiles here represent only a sampling of the tireless work performed daily to make Children’s Hospital a place of unwavering hope. In each issue, we also include a profile to highlight our longstanding partnership with our community pediatricians who help ensure all children receive the best care each and every day. Robert Naftel, M.D., grew up witnessing the intense dedication, passion and life-changing moments that physicians experience. Yet, it wasn’t until college that he realized it was his calling. The Birmingham, Alabama, native attended Washington and Lee University in Lexington, Virginia, inspired by a high school teacher to major in Chemistry. He ran cross country, served as president of the student body and was head adjudicator of the honor system. Those leadership roles prepared him for future challenges, and his volunteer work also fostered in him a servant’s heart. After completing a Bachelor of Science in Chemistry in 2002, Naftel moved home and enrolled at the University of Alabama (UA) School of Medicine. He was drawn to neurosurgery as a specialty and completed his residency training in neurosurgery at UA of Birmingham in 2012. He completed a fellowship in pediatric neurosurgery in Pittsburgh. In August 2013, Naftel began his work at VUMC specializing in pediatric neurosurgery. Naftel’s specialty focus areas include epilepsy surgery, hydrocephalus treatment, spasticity surgery and endonasal (through the nose) surgery. He continues to look for medical advances in treating hydrocephalus (fluid accumulation on the brain) and traveled to Africa to learn from world experts. Outside the office Naftel and his wife, Kimberly, spend time chasing after their toddler daughter and pet Goldendoodle. He enjoys running, and he and his wife also like to ski as well as bike both locally and as far away as Paris and Italy. As a stem cell transplant physician Carrie Kitko, M.D., is keenly aware of the fine line she walks between cure and complication. While her goal is to cure children with challenging cancers and other conditions such as immune deficiencies and sickle cell disease, patients sometimes develop a very significant complication after the transplant called graft-versus-host disease (GVHD). “The transplanted bone marrow generates a new immune system that unfortunately sometimes goes rogue and attacks the patient, or ‘host,’” said Kitko, associate professor of Pediatrics and medical director of the Pediatric Stem Cell Transplantation Program. “So for some of my patients, I feel like I cure one disease, but give them something that can be just as bad. “I really want to gain a better understanding of who gets this complication and try to predict who’s going to get it, which may allow me to start treatment sooner or more aggressively,” she said. At the University of Michigan, first as a fellow and then as a faculty member, Kitko worked with a team of investigators to discover biomarkers for acute GVHD, which typically develops in the first 100 days after transplant. This was done using blood samples collected from patients at various timepoints after transplant. The team developed an algorithm based on three biomarkers to calculate a risk score—the Ann Arbor GVHD score—that predicts which patients are at the highest risk of dying from acute GVHD. Kitko is leading Vanderbilt’s participation in two national studies using the biomarker panel at the onset of GVHD to help determine treatment. She is also helping develop a pre-emptive treatment trial for patients with high-risk biomarkers detected only seven days after their transplant, with the goal of preventing GVHD altogether. In addition, Kitko is leading a multi-center study of extracorporeal photopheresis as a treatment for pediatric acute GVHD. Photopheresis uses a machine to separate and collect a patient’s white blood cells, which are then treated with a medicine that is activated by ultraviolet light and infused back into the patient. The treatment “calms” the immune system and improves GVHD. Kitko and her University of Michigan colleagues also discovered a biomarker that is present at the onset of chronic GVHD—a form of GVHD that develops later after transplant and can affect almost any part of the body. Kitko is particularly interested in this form of GVHD, which can impact a patient’s quality of life for years. Recognizing the importance of team science, Kitko is forming a pediatric chronic GVHD consortium of centers to follow patients and build a biorepository for additional biomarker discovery. Kitko knew from a young age that she wanted to be a physician, and by high school she had decided to pursue a career in pediatrics. Following her pediatrics residency at Duke University, she completed a Hematology/Oncology fellowship. Kitko joined the faculty at Vanderbilt in summer 2015, after 12 years at the University of Michigan. She and her husband, a nephrologist, stay busy with their 10-year-old son and his sports activities, and they enjoy collecting wines from around the world to share with friends and family. Atia K. Jordan, M.D., wanted to be a doctor and help sick children before she knew the word pediatrician. The assistant professor of Clinical Pediatrics followed her dreams and accomplished her goals all at Vanderbilt University, a place she calls home. The Collierville, Tennessee, native had a big choice after graduating high school: where to attend college and pursue her medical degree. After obtaining her Bachelor of Science degree in 2005, and her medical degree in 2009, Jordan completed an internship and residency at Cincinnati Children’s Hospital. She returned to her alma mater to complete a fellowship in sleep medicine. While a sleep-deprived resident doing a pulmonary care rotation, she noticed frequent discussions about sleep, but did not feel she had the tools to adequately educate her patients and families. “Between my medical interest and desire to provide more advice and education for my patients, I pursued sleep medicine further,” Jordan said. In 2014, she became an attending physician at Monroe Carell Jr. Children’s Hospital at Vanderbilt. Jordan is a general pediatrician who focuses on pediatric sleep medicine and cares for children with various sleep disorders, including obstructive sleep apnea, insomnia and narcolepsy/excessive daytime sleepiness. Jordan enjoys spending time with her parents, younger brother, closest friends and extended family. She also loves to travel around the world. “There is so much world (and even country) to see, and I get away as often as I can. I have even taken a few solo trips, which have been awesome experiences,” Jordan said. She also loves to craft and exercise her artistic skills. Spending an afternoon roaming around a craft store and working on five to six craft projects brings her solace and peace. Timothy Eidson, M.D., is the definition of a community pediatrician. His practice, Rivergate Pediatrics, is about a mile from Gateway Elementary School, where he went to school. Some of his patients are students there now. 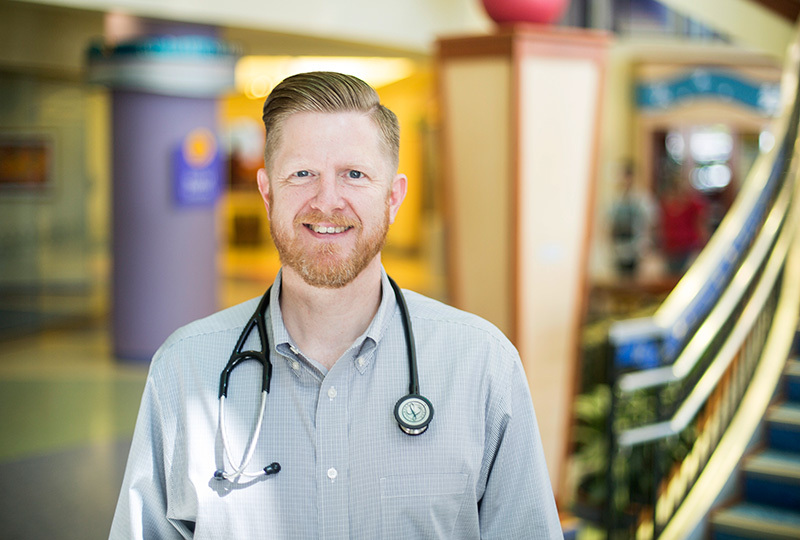 Eidson grew up in Goodlettsville, Tennessee, and only left long enough to attain his college degrees and complete his residency at Baylor College of Medicine in Houston, Texas. He returned 16 years ago to join the staff at Rivergate Pediatrics, where he and four other pediatricians serve the community. Goodlettsville is also his home, where he lives with his wife, Stephanie Eidson, M.D., and children, Matt, Elizabeth, Mariana and Mark. Eidson, associate clinical professor of Pediatrics, has long ties to Vanderbilt. He hosts one or two students from the School of Medicine at his office each year. Those students voted to give him the Alpha Omega Alpha Clinical Faculty Award for 2012. For more than a decade, he has served on the Physician Advisory Council at Monroe Carell Jr. Children’s Hospital at Vanderbilt. At least four times a year, he shares information with top hospital leadership. “That relationship has been very good and I’m happy that Vanderbilt sees the importance of involving the community in changes or decisions that are made at the Medical Center,” he said. Stephanie Eidson, his wife, is also part of the Vanderbilt family. She is an assistant professor of Clinical Pediatrics and works at the Vanderbilt Children’s After-Hours Clinic in nearby Hendersonville, Tennessee. The couple met at Baylor, where both of them completed their residency. When Eidson isn’t running a successful practice, he’s running on the pavement. He’s completed more than 10 half-marathons and one marathon. “My kids are starting to enjoy running, and so we enjoy some of that together,” he said. He plays piano, as do each of his children, who range in age from 8 to 13. Eidson, an elder and Sunday school teacher at Sumner County Upper Cumberland Presbyterian Church, said community work is important to him. He and his wife teach prenatal classes at the Cumberland Crisis Pregnancy Center in Gallatin. He’s also the former president of the Cumberland Pediatric Foundation, where he’s passionate about public health. One of his recent initiatives was promoting the HPV vaccine to prevent cancer. The Tennessee Chapter of the American Academy of Pediatrics awarded him Pediatrician of the Year in 2014 for his work in the community and with the Cumberland Pediatric Foundation. Community outreach is something that’s important to all the physicians at Rivergate Pediatrics.